Do you have any missing teeth? Dental implants have quickly become one of the most popular replacement methods because of their look and function. Dental implants are metal posts that get placed in the jawbone, beneath the gums. They act as artificial tooth roots ready to be mounted with replacement teeth. Implants are one of the best options to complete smiles, but there are a lot of myths and false information out there about them. Keep reading to learn about myths surrounding dental implants and whether or not they’re true from an expert implant dentist. Dental implants and bridges are two common ways to replace teeth. With a bridge, your teeth next to the gap are shaved down to accommodate the false tooth or teeth. A bridge is a single unit that gets placed over the reduced teeth to fill in the gap of one or multiple missing teeth. In most cases, dental implants are a better option because they preserve the structure of your surrounding natural teeth. Bridges can cause your natural teeth around the gap to bear more stress, which can lead to bridge failure and replacement. Many people avoid implants altogether because they think the procedure is painful. In reality, your dentist will use local anesthetic to numb the area, so you won’t feel much pain or discomfort. The most pain or sensitivity you’ll feel will be waiting for your implant to heal. Your dentist will recommend medications for you to manage the aching and feel better. Possibly the biggest myth surrounding implants is that the restoration won’t look like your natural teeth. Once your implant is placed, nobody will be able to distinguish the difference between your restoration and natural teeth. Your dentist has state-of-the-art technology that can match the false tooth to look exactly like your original smile, and the implant allows the restoration to mimic the way your teeth emerge from your gums. While some companies that offer discounted dental implants are legitimate, others are using cheaper materials to make low-quality products. Since dental implants are placed in your jawbone and act as a living part of your body, it can be dangerous to introduce foreign materials. Most dental implants are made of biocompatible titanium that doesn’t harm your living tissue. 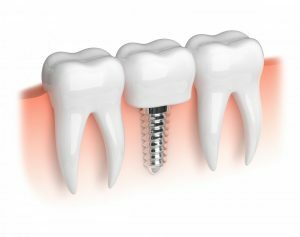 Now that you know some of the common myths surrounding dental implants, you can consider them as a great option for tooth replacement without worrying about false information. Talk to your local dentist to get started! Dr. Jaclyn Jensen prides herself on treating patients like family and focusing on patient comfort. She likes being able to renew smiles and confidence with the help of dental implants. She stays up-to-date on the latest techniques in dentistry through continuing education. She currently practices at Renu Dental where she can be contacted through her website or by phone at (218) 281-1301 for any questions you may have.